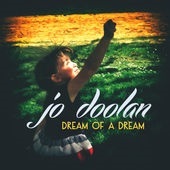 Recorded at Derek Nash's Clowns Pocket Studios, Dream Of A Dream is the debut album from singer/lyricist Jo Doolan. Jo has been receiving acclaim for her highly personal vocal approach and direct style, when interpreting contemporary songs and jazz standards. With Dream of a Dream, Jo offers unique interpretations of modern popular songs. Two contemporary jazz compositions were also recorded for the album. Here, Jo sings in the vocalese style. The birth of Jo's daughter inspired her to write new lyrics to the melody and original saxophone solo of Wayne Shorter's Infant Eyes and she has penned haunting and poetic lyrics to title track, originally a composition by Richard Rozze (recorded on his album Learning to Fly,2014). Richard has also masterfully arranged the songs on the album, the orchestrations exploring contrasts of musical colours and textures. Jo's band consists of a strong British contingent of contemporary, creative musicians- Andrew Bain (drums) Paul Booth (saxophones/bass clarinet/melodica), Richard Rozze (acoustic and electric guitars), Dave Whitford (double bass). Live To Tell also features the vocal talent of critically acclaimed singer/songwriter Sara Colman.